Three Pacific White Sided Dolphins frolick and play at sunset in the Johnstone Strait off the coast of Vancouver Island in British Columbia. Dolphins are well known for their playful antics and interactions. 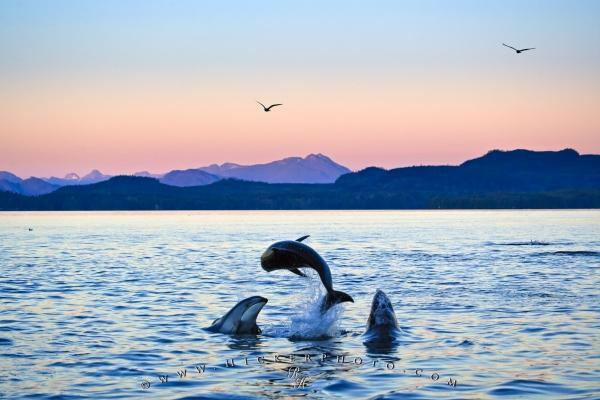 These three Pacific White Sided Dolphins are frolicking and jumping during sunset in Johnstone Strait off the coast of Vancouver Island in British Columbia, and they are just having a fun time playing together and enjoying the end of another day free in the ocean. Dolphins are known for their playful antics and as they are such a social mammal they like to hang out together just as humans do and to play as perhaps a group of young children would want to do in the water. ... They are very close in looks and actions to the Dusky Dolphins, which are found in the southern part of the Pacific. They are named the Pacific White Sided Dolphin for obvious reasons, as they live in the Pacific and they have a flash of a light grey on their side, which can be hard to see if they are moving quickly but it is how they are distinguished. They do have many colors on them however, such as various shades of greys. They are no longer listed as endangered, but there was a time when many Pacific White Sided Dolphins were killed in drift nets, but the United Nations finally imposed a ban on these kinds of nets in 1993. Pacific White Sided Dolphins frolicking in Johnstone Strait off Vancouver Island at sunset, British Columbia, Canada. I photographed this photo with the digital SLR camera model Canon EOS-1Ds Mark II, aperture of f/6.3, exposure time of 1/500 sec. on ISO 400, as always I used a original Canon Lens, the focus lenght for this picture was 115mm.